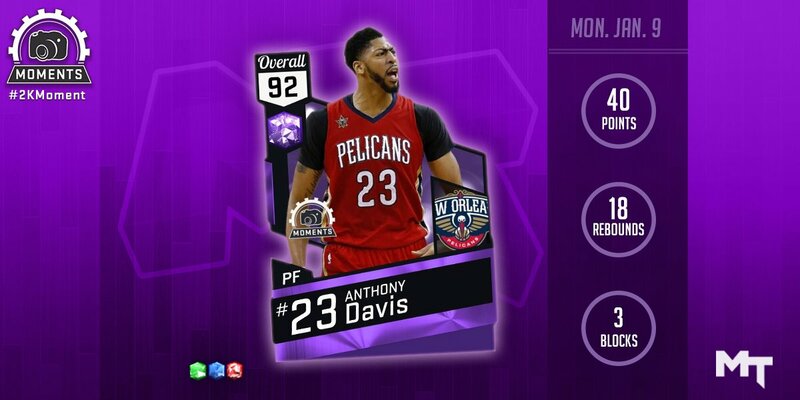 Yesterday, the official NBA 2K17 MyTeam twitter account released a new Amethyst moments card and a new Moments challenge which are both featuring Anthony Davis. In this Amethyst card, Davis got a high 92 rating and scored 40 points, 18 rebounds and 3 blocks in his performance against the New York Knicks. This card is now available in MyTEAM League Packs. This time's Moments challenge was inspired by Davis' recent performance. You can use any version of Anthony Davis. At the moment, there are four versions available. 82 overall is the cheapest and weakest version, and you can get it at the auction house for a small amount of MT. 86 overall comes with B+ grade on inside scoring and B for mid range, making this challenge easier to complete. 89 and 92 are also available. If you have enough MT, you can buy any of these versions, complete the challenge, and sell back the card at the auction house. Set the quarter length to 5 minutes while the challenge is set to All-Star difficulty. The challenge has some lineup requirements. Keep in mind that you will also need two New Orleans Pelicans players in your lineup. If you don’t have any, just check the auction house and get the cheapest ones available. Anthony Davis has a great inside and mid-range game, which you should definitely use to complete this challenge. Using a solid point guard, play some pick and rolls and pick and pops with Anthony Davis as the screener. As he gets open, feed him with accrued passes for some easy baskets. If the defenders decide to switch, use Anthony’s post moves, since he will not have problems scoring over a smaller defender. You should also consider equipping Anthony with some shoes for some additional stats boosts in a desired category. Remember that after completing this challenge, players can get a reward for 6000 MT. The reward is quite generous. You need to score 40 points with Anthony Davis. It's also worth it to note that winning the game is also necessary for completing this challenge. Find out the Moments challenge and win the award! Of course, if you need more NBA 2K17 MT to buy Anthony Davis' card, visit our site and search for more news about NBA 2K17.